Enrique Simonet Lombardo (1866–1927), Otoño en la Dehesa (Autumn in the Pastures) (1918), oil on canvas, 58 x 43 cm, location not known. Wikimedia Commons. In my first article about the Spanish painter Enrique Simonet Lombardo (1866–1927), I showed examples from his career prior to 1900. This article resumes the story of his paintings during the twentieth century. In 1901, Simonet was appointed a professor at the School of Fine Arts in Barcelona. For much of the rest of his career he was engaged in teaching. Enrique Simonet Lombardo (1866–1927), The Judgement of Paris (1904), oil on canvas, 215 x 331 cm, Museo de Málaga, Málaga, Spain. Wikimedia Commons. Simonet’s The Judgement of Paris (1904), a huge canvas now in the Museo de Málaga, was perhaps his last famous painting. It shows the popular Greek legend which has been depicted by a long succession of painters, including Paul Cézanne and Renoir. Eris, the goddess of strife and discord, gave a golden apple from the Garden of the Hesperides “for the fairest” woman, leading to a contest between the goddesses Athena, Hera, and Aphrodite. This was judged by Paris (or Alexander), son of King Priam of Troy. The goddesses played dirty, and each promised Paris a reward should he choose them. When Paris chose Aphrodite as the winner, she had promised him the hand of the most beautiful woman in the world, Helen, who also happened to be married to the King of Sparta, Menelaus. Aphrodite then helped Paris seduce and abduct Helen back to Troy, and Athena’s rage at losing caused her to join the Greeks in the Trojan War. Simonet shows, from the left, Athena, Hera and Aphrodite, with Eros, Aphrodite’s son, at her feet, and Paris. He compares the beauty of the goddesses with flowers and a peacock in full display behind them, and Paris, clad in an animal skin, with a flock of goats. Enrique Simonet Lombardo (1866–1927), Eclipse (1905), oil on canvas, 75 x 55 cm, location not known. Wikimedia Commons. Although many painters, particularly the Impressionists, have shown fleeting effects of light and the occasional rainbow, Simonet took the opportunity of a solar eclipse on 30 August 1905 to paint his Eclipse (1905). 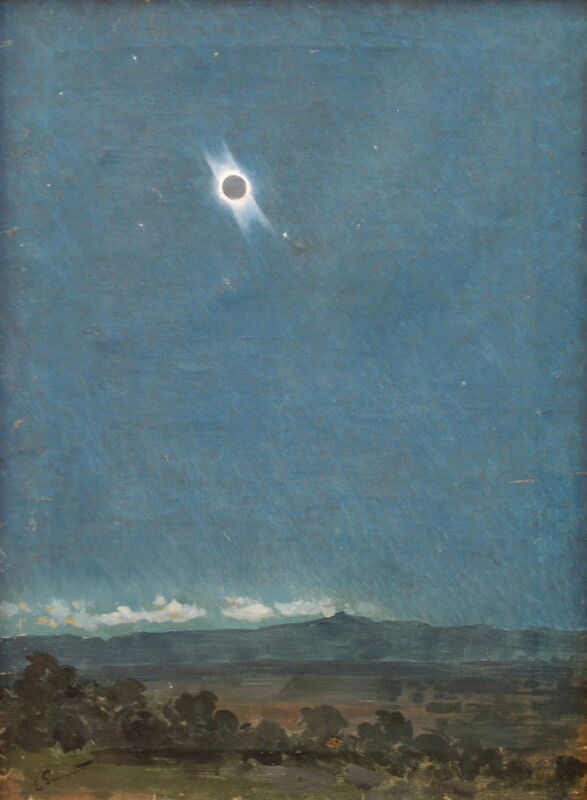 The eclipse was visible across eastern and northern Spain between about 1300 and 1320 UTC, and this painting is one of its few remaining records. Enrique Simonet Lombardo (1866–1927), Tangier Market (1913), oil on canvas, 48 x 64 cm, location not known. Wikimedia Commons. 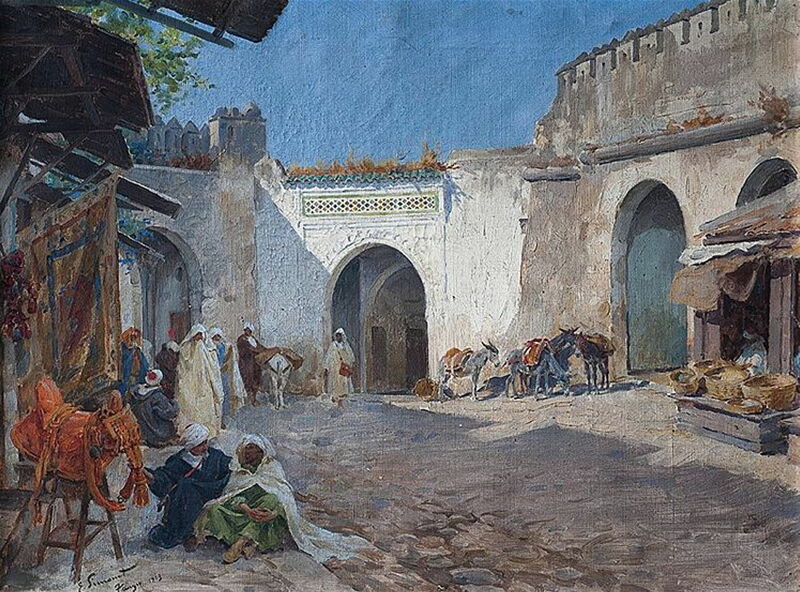 Simonet returned to Morocco, painting several works there including Tangier Market (1913). 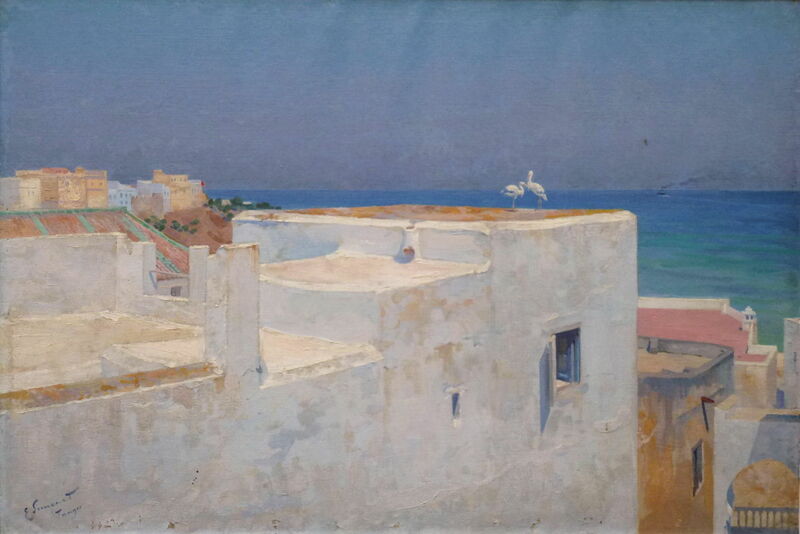 Enrique Simonet Lombardo (1866–1927), Terraces of Tangier (1914), oil on canvas, 56 x 84 cm, location not known. Wikimedia Commons. Enrique Simonet Lombardo (1866–1927), Tangier at Dusk (1914), oil on canvas, 68 x 93 cm, location not known. Wikimedia Commons. 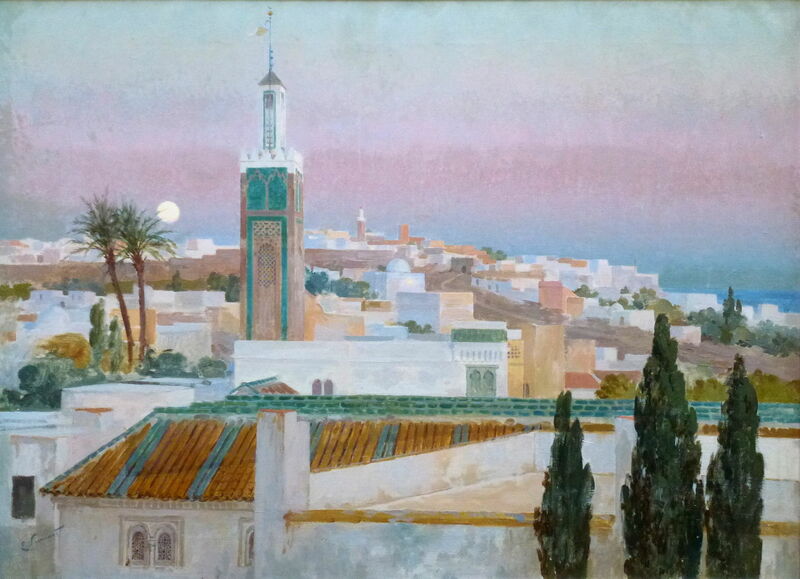 In his Tangier at Dusk (1914), his style has changed towards using flatter areas of less intense colour, giving this painting more the appearance of a watercolour. Enrique Simonet Lombardo (1866–1927), Otoño en la Dehesa (Autumn in the Dehesa) (1918), oil on canvas, 58 x 43 cm, location not known. Wikimedia Commons. Following the First World War, Simonet seems to have concentrated his work on the landscape of Spain. 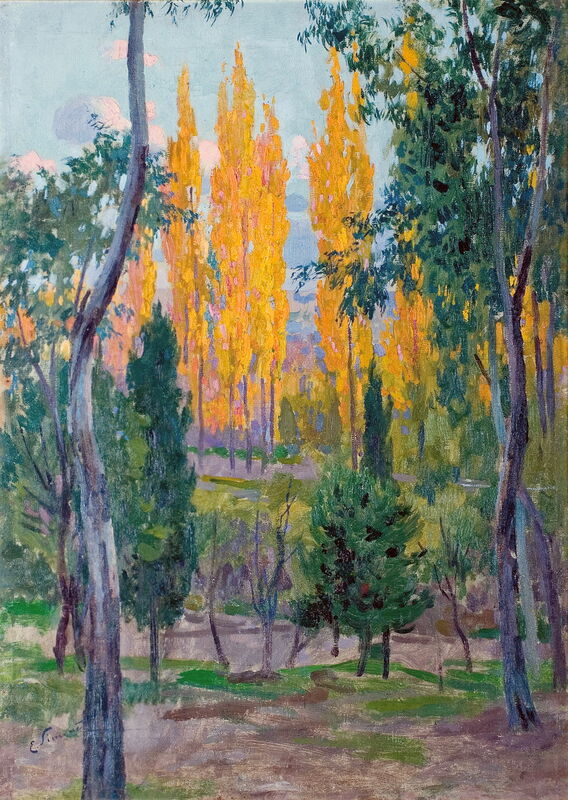 Otoño en la Dehesa (Autumn in the Dehesa) (1918) shows the brilliant colours of foliage in a landscape characteristic of southern and central Spain and Portugal (where it is known as montado). The Dehesa is a mixed, multifunctional area providing grazing for cattle, goats, sheep and pigs, mixed trees centred on oaks, and support for many endangered species such as the Iberian lynx and Spanish imperial eagle. Enrique Simonet Lombardo (1866–1927), La Moncloa Landscape (1918-20), oil on canvas, 47 x 56 cm, location not known. Wikimedia Commons. 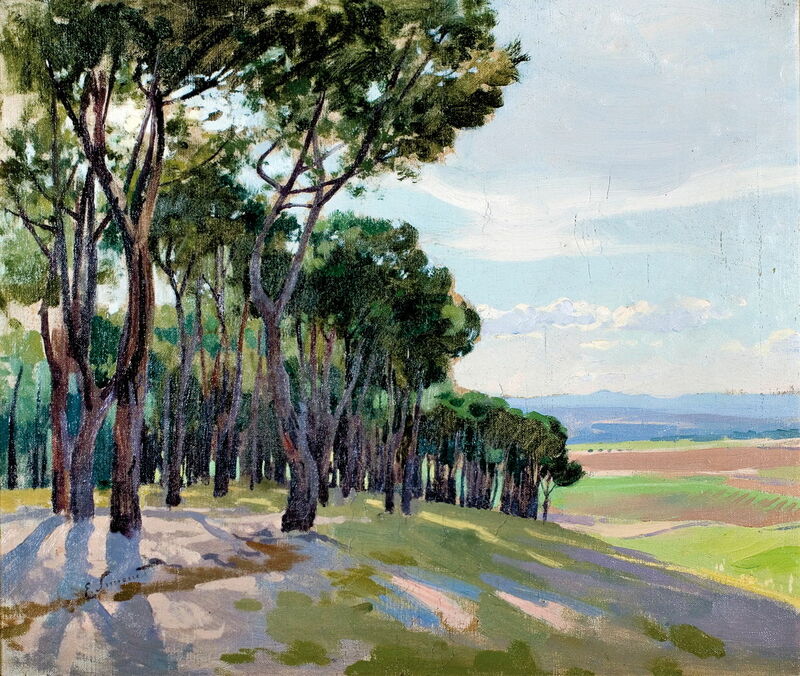 La Moncloa Landscape (1918-20) shows another rural area, with its ancient woodland and open plains. There may also be a pun intended, as the term La Moncloa can be used to refer to the central government of Spain. Enrique Simonet Lombardo (1866–1927), Reflections on the River (1918-23), oil on canvas, 62 x 44 cm, location not known. Wikimedia Commons. 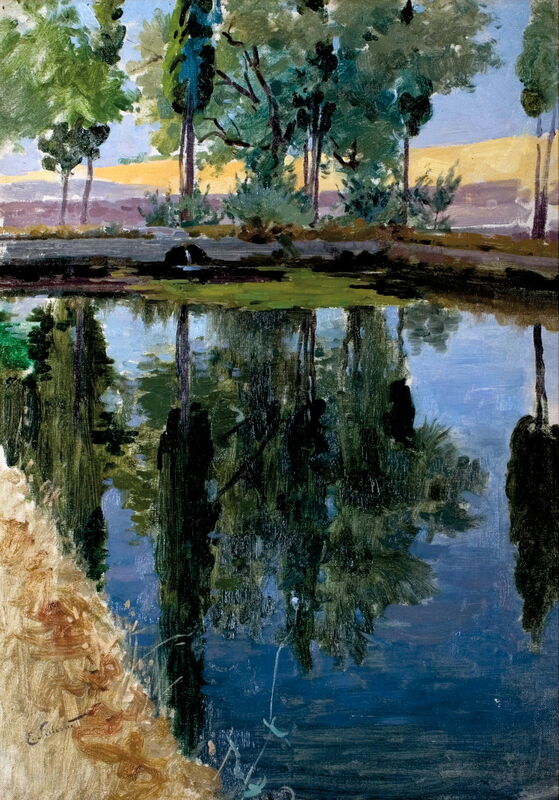 Most of his paintings of this later period, such as Reflections on the River (1918-23), are pure landscapes. Enrique Simonet Lombardo (1866–1927), El Paular Landscape (1921), oil on canvas, 62 x 78 cm, location not known. Wikimedia Commons. 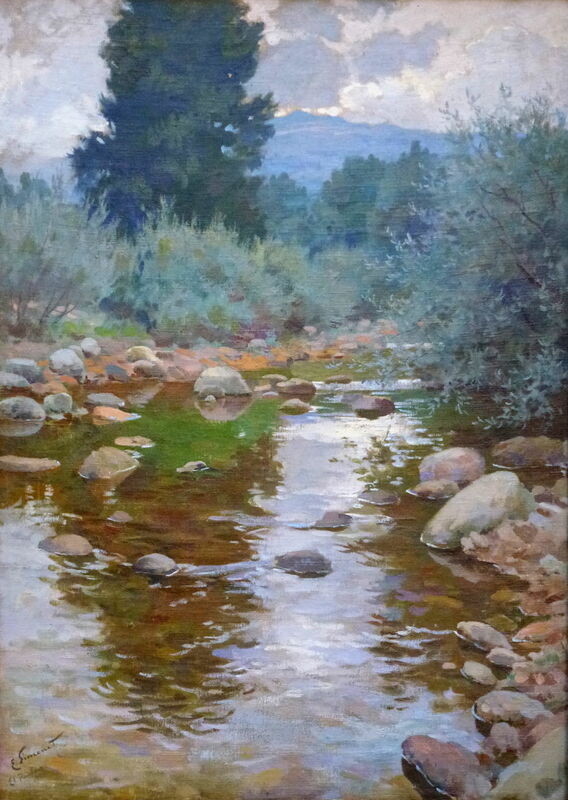 During 1921-22, he was the director of landscape painting courses held in El Paular, to the north-west of Madrid. There he painted some of the finest of these late works, such as his El Paular Landscape (1921). 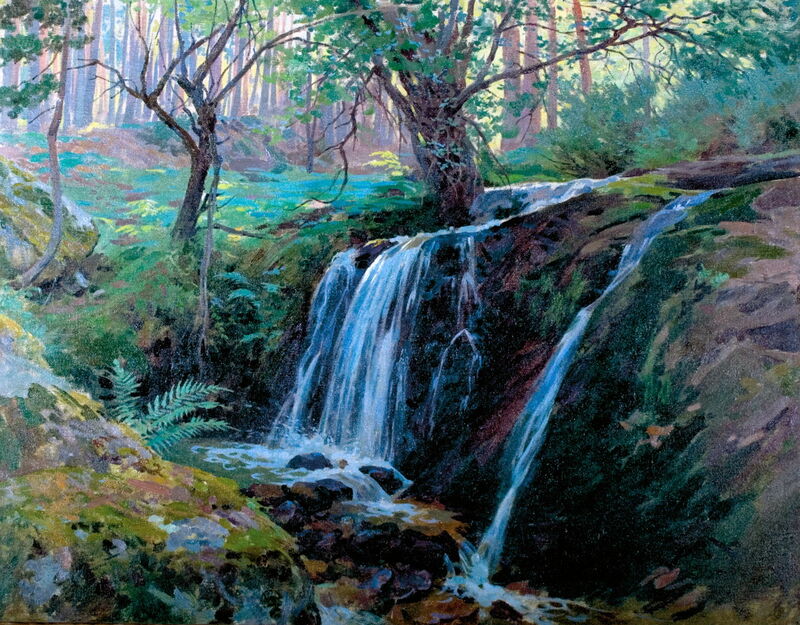 Enrique Simonet Lombardo (1866–1927), Hiruela Waterfall (1921-23), oil on canvas, 70 x 90 cm, location not known. Wikimedia Commons. Hiruela Waterfall (1921-23) is set in dense woodland to the north of Madrid. 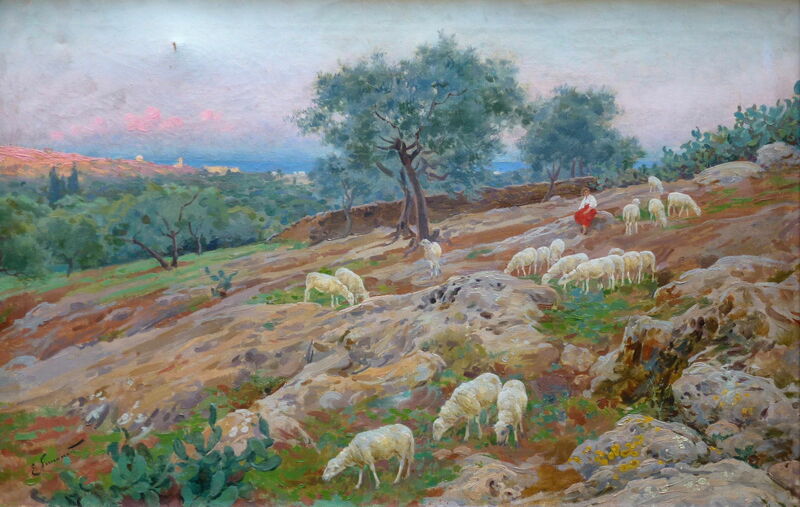 Enrique Simonet Lombardo (1866–1927), Flock of sheep (date not known), oil on canvas, 47 x 72 cm, location not known. Wikimedia Commons. Visibly damaged and undated, Simonet’s Flock of Sheep appears to show a rocky pastoral landscape just inland of a Mediterranean coastal town. Once again, the very narrow view which we are given of art history during the late nineteenth and early twentieth centuries omits major works by an important painter – whose career and paintings are almost undocumented outside Spain. Posted in General, Painting and tagged dehesa, Impressionism, painting, Post-impressionism, Simonet, Spain, Troy. Bookmark the permalink.